All Replies on Help with dust collection!?!?! 1. You need a sturdy can or bin. I use a large Brute trash can. You can also use a plastic drum with a band clamping lid or a fiberboard drum – anything strong enough to hold up the vacuum. 2. The lid needs to be air tight. I made a seal out of a bicycle tire and just stapled it around the rim. Also, 6” will give a better performing system for a blower that size. 4” flex should fit over 4” PVC Sch20. Try to use a good quality flex (not the cheap black stuff). I got mine from PennState. If you remove a few inches of the wire banding it will slide over the pipe really nice. You’ve got a good system going but as the previous poster mentioned, you need to change from a plastic garbage can to a sturdier barrel. Chemical barrels of rigid plastic are usually available for free. Or use a steel barrel or make a wooden one. Cut the height down to match your frame as needed. As for the hose issue, you get what you pay for in flexible collection hose. I do not care for the self-collapsing stuff as it is nothing but a headache. However, you can make even this stuff work by using a hair dryer to soften the hose before you slide it over a fitting. You use the same trick to down-size rigid pvc pipe. Big point here. The flex pipe goes ON TO not IN TO. Mr. rwe has given you some good pointers. Don’t give up. 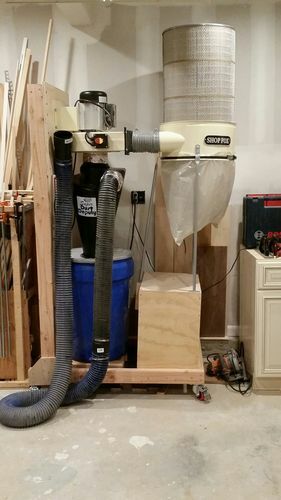 I have the HF unit with felted bags (Highland Woodworking), and use flex hose for the TS, the DW 733 planer, and the band saw. No fancy stuff, but it sure works well. 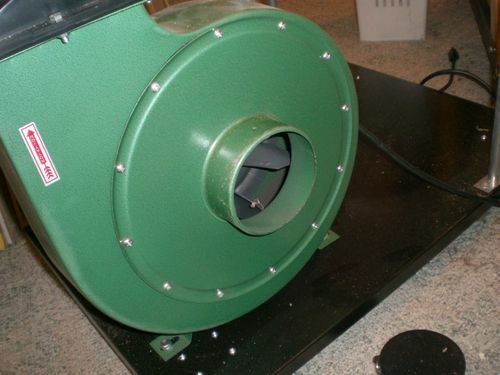 I have a simular setup but with a less hp motor and loving it, I mounted my blower right on the sdd with a solid barrel 30 gallon barrel off amazon for 30-40 dollars and it really has great suction. I don’t have a lot of duct work I directly connect to each too on a mobile cart and it’s been a game changer for me with dust control. Check your connection to see if there a any leaks also. Thanks alot for your replies! I figured Id need a sturdier collection can but have seen people put all sorts trash cans under neath without mentioning anything! I guess I have another trash can now. Eflanders, where would you recommend me going for a free one? Any little bit will help! As far as the hose, its only temporary until I’m officially set up so I got a good sturdy one with metal rings and thicker plastic. I was a little afraid of taking a torch to it but Ill sacrifice a little bit and give it a shot. Ill let you guys know on Friday when Im back in my shop if Im successful with that. Thanks for your feedback guys! Crossbars and air restriction tapers? I have a pretty good seal all around and have a line of weatherstripping underneath the lid so it should be pretty air tight. Im always game for more performance tho so please elaborate! Crossbars and air restriction tapers? is there any thing that appears like a cross bar or a taper on the unit opening? mine originally looked like this with the cross bars and the taper on the lip the hose mounts on. also, I mounted it much closer to the unit directly on top sdd and I get very good suction. this is my setup similar to yours but mobile and I shorten the runs between connections I have a 1.5hp unit and get great suction on the unit, the only time it goes down is when I need to clean the filter. Hope it helps. You already spent the money on the cyclone so I won’t tell you that was a total waste. 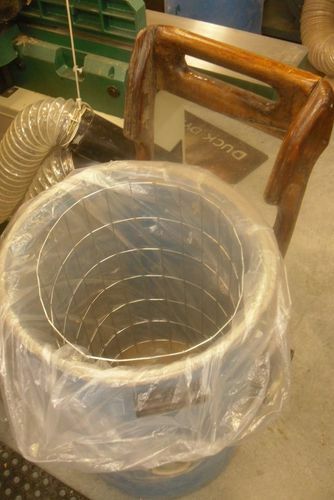 The cartridge filter was the best thing you can do for any bag type dust collector. The HF collector is a great value; I’ve used one for 10 years. Replace the plastic trash can with a heavy fiber or plastic drum, or even a simple plywood box. Just make sure its air tight. Even a tiny leak at the bottom of a cyclone kills its ability to separate dust from air. Back to the cyclone comment. A cyclone is a good filter but requires a lot of static pressure to be effective. The ability of a cyclone to separate dust particles from an air stream is directly proportional to the amount of pressure drop through the cyclone. 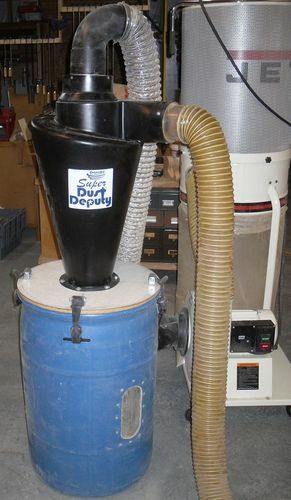 Most inexpensive dust collectors are lacking in the pressure department to start with. That said, it is good to have a separation stage before the fan to reduce the amount of junk being sucked through the blades. A simple expansion chamber would be perfectly effective for this purpose and would not reduce your static more than an inch or two. The only week spot seems to be the can. Hit a fertilizer place and see if they have a 30 gal drum they’ll part with for coffee money. Here’s mine, which uses truck hood hold downs and door gasket. I used some fencing I used to make tomato cages to hold the cheap, clear bags in place. Since they are clear, you can see into them through the level indicator I installed [which should go up another ten or so inches]. This is now in front of my 3hp, four bag collector. 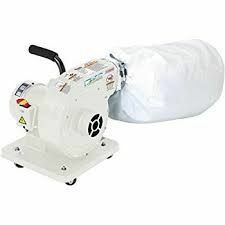 For air leaks around the bag of the collector, pick up a roll of the foam they use to seam campers to pickups. Oh, and in addition to my Jet 1-1/2 hp and Jet 3 hp collector, I have the HF collector. I think it’s an excellent buy. I keep seeing the references to the tornado cages. For those using them is your material that your collecting fine dust, or planer type shavings. I can’t imagine the mess from having to dig that cage out and pull a 50 gallon bag of shavings out of the barrel every 20 minutes when I’m planing. I know if I were only using it on my TS it would take months to fill both barrels on my system, but most of the miles my DC sees are from my big 3. the 20” planer, and 2 william & moulding machines. They make large curls and chips. I have actually regressed on DC for the planer in the summer months. If I am planeing more than 200 BF I roll the planer out into the drive, put down a tarp, let her fly, and shovel the mess into the gator when I’m done. Tomato cages? I built my bag holder using fencing left over from tomato cages I built. Where I live, the pathetic things stores sell are too small to corral a tomato plant, so I build my own with about a two foot diameter. Anyway, my Super Dust Deputy collects off my lathes, jointer and planer, sanding stations, table saw and lathes. As such, the drum gets filled with a mix of fines and shavings at times, fines when I’m doing a lot of cabinet saw work and shavings when the lathe gets escaped to (my get away machine). I find just shaking, twisting and turning the cage allows it to pull out of even fifteen or twenty gallons of fines. There really isn’t any mess. At most, I end up with a half cup on the floor, but the four inch “vac” hose off the collector grabs that up just fine. I did have to grind off screws that secured the handles and view port on the inside of the drum, so they wouldn’t snag the bag. The bags are so frail, I’ve started using two, but can still see inside the drum to monitor levels. If you’re planing, it should be even easier to empty, since the chips and shavings are bigger. I might have let my old Belsaw fun without a collector, but nothing I run today would, if only to keep the rollers clean. I use a Tempest cyclone (no longer made) and will second the recommendation for a fiber drum. Mine is 55 gallons, but they are commonly available in a 30 gallon size as well. I bought mine from a drum recycling business locally. It originally contained sun dried tomatoes and cost me all of 20 dollars. You want to get the snap ring type so the lid comes off easily.